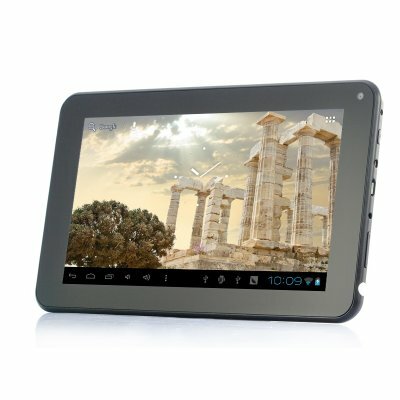 Successfully Added Android 4.0 Tablet PC "X-Screen" - 7 Inch Screen, 1.2GHz CPU, White to your Shopping Cart. Android 4.0 tablet PC with a large 7 Inch screen and a powerful 1.2GHz CPU combines the intuitive Android 4.0 operating system with a stylish design all at a great price. This Android 4.0 tablet has been designed with beautifully carved sides to sit comfortably in your clasp. And with a stylish white eggshell design, this Android tablet PC not only lays great specs at your fingertips but also stands alone as a modern fashion accessory at an incredible price. This perfectly sized 7 Inch tablet PC brings you a powerful “ALLWINNER A13” chipset and impressive 1.2GHz CPU combined with Android 4.0 OS, making multitasking capabilities a simple breeze. Use the Google Play Store to download hundreds of apps, play games, surf the net and take pictures and videos with ease, then store your files on the internal memory or onto your external Micro SD card, supporting up to 32GB. This Android tablet 4.0 OS is the ideal size to watch movies, use the internet, view pictures and videos then stick into your backpack or pocket! Ultra portable this tablet is not too big or hefty to lug around and not so small that you have to squint to see the screen. This 7 Inch Android 4.0 tablet with 1.2GHz CPU is a must have for any gadget lover and is brought to you at a factory-direct price that can't be matched. Available in our warehouse now, it is ready for immediate shipment to you or your customer. Brought to you by Chinavasion, the leader in wholesale android tablets and consumer electronics.